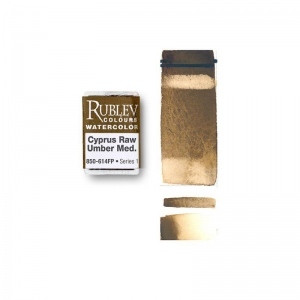 Details Rublev Colours Cyprus Raw Umber Medium is a semi-transparent reddish brown with good tinting strength, medium grained and, like most Rublev Oil Colours, brushes "long" in the direction of the brush stroke. 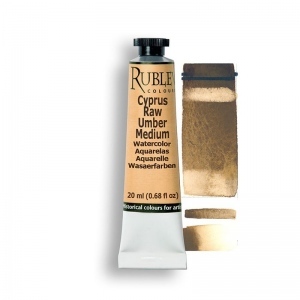 Our Italian Cyprus Raw Umber Medium is from Cyprus. 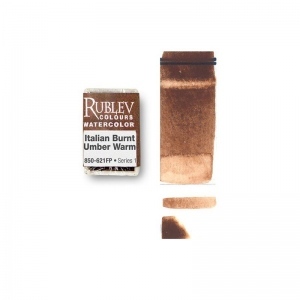 Note: Colors swatches are shown in mass tone, straight from the tube, on the left, and mixed with an equal amount of Titanium white on the right. All pictures of color swatches in this web site are only approximations of the actual color of the oil paint. We taken every care to match the color in these pictures on calibrated color monitors to the actual color. However, because of the wide variance in color monitors the results you get may vary. Note: Some separation of pigment and oil may occur in Rublev Oil Colours and is a natural process when no wax or stabilizers are added to paint to prevent this from occurring.